During the past weekend a deadly Typhoon hit the Kanto area, making it rain non-stop in Tokyo from Saturday night to Monday morning. At my shared house in Kagurazaka, we weren’t very keen on going out for grocery shopping in the hard rain, so we cleaned up our refrigerator, shared whatever ingredients we have left, and made simple dinner together. Beside the food, we created an original drink together for a homey Sunday night chill. I’m calling it a Happy House Cocktail No.1. It’s very simple, yet very delicious, so I would like to share the recipe with all Tulip girls. Going out in Tokyo is fun, but it can cost too much. Drinking at home, on the other hand, is very affordable. If you drop by a liquor store, a supermarket or even a convenient store (Konbini), you get a big variety of inexpensive beer and wine. But the best part is the hard liquor. Because the tax for alcoholic drink is pretty low in Japan, you can find, for example, a bottle of Bacardi rum at around 1200 Yen. Now listen, never order an overpriced Mojito at a cocktail bar again. Make your own at home. Share the cost with your mates, and also the fun! 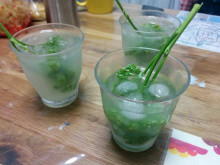 Well, today I’m sharing the recipe for the original Happy House Cocktail, but if you guys are interested in a delicious Mojito recipe, drop me a message. I will get back to you soon. 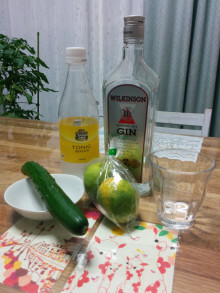 – 15ml Gin (London Dry) – I got this cheap gin for only 900 Yen at a liquor store! Just mix them, and stir or shake well. * For the lime juice, squeeze the lime and leave the skin in the juice for at least 30 minutes before use. The skin will give the bitterness that goes really well with gin and tonic water. In case you don’t like it bitter, you can skip this tip. * For the herb/vegetable, I used parsley when I first made it on Sunday. I just washed ans soaked the the whole thing (both stem and leaves) in the drink, and then used it as a stir stick. Not bad right? 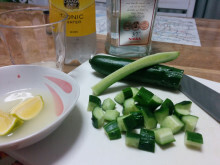 When I made this cocktail again yesterday, I used a cucumber (see photos below). I cut it into one stir stick, and then chopped the rest into small cubes. 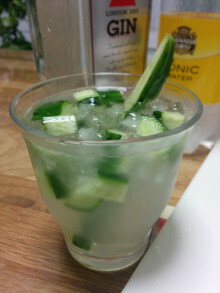 The good thing about cucumber is that you can also eat it while you are drinking! In case you prefer richer herbal aroma, go for mint or lemon basil instead. They are a bit pricey and harder to find here though, compared to the first two choices. 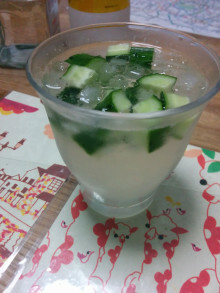 If you are planning to make this cocktail at home, please let me know how you like it and share some photos. And if you have any nice food or drink you have made with your house mates, please share your stories with us!